The sky was done with watered down black ink and rock salt chucked randomly on top. First time I’ve tried it, not too bad. The rest was freehand and trying to bleed the ink into wetted paper for the gradations. The windows and lights were drawn with fine liner and a posca white marker (like a tippex). Very cool. I’m amazed by your inkings. I’ve not used any real ink beyond a ballpoint pen, haha. Do you use India ink? What kind of pen? It looks difficult but I might try it sometime. For the sky I used India ink (well, it’s Chinese ink but I guess it’s the same thing) and watered it down quite a bit, probably only 25% ink and 75% water. I marked out where I wanted the black in advance with pencil and then went over it with plain water first, then I went over again quickly with the black ink mix so it bled into the picture. Very quickly I then sprinkled salt over the whole thing, pressed down hard with a piece of card and left it overnight. The next morning I dusted off the salt which had soaked up some of the ink and hey presto – instant stars. Some of the salt was embedded in the paper so I picked it out with a scalpel, that was also quite effective at bringing up some nice white points of light. 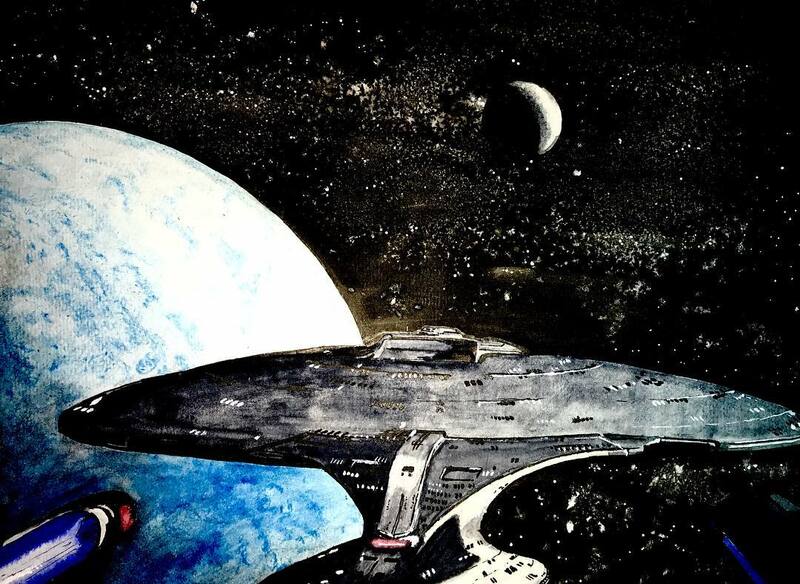 For the shading on the enterprise I did the same thing with the ink mix, pre-wetted the shape and then fed in some ink from the left hand side. I’m not very experienced at it, well, in fact this was my very first try so it didn’t quite go as I hoped. The black details were added with fineliners and a Pentel ink brushpen. Previously I’d have used a Chinese goat-hair brush and Chinese ink but having discovered this brushpen I can’t see a reason to go back unless I needed to paint really fat lines. For A5 size these are perfect. The planet was with regular watercolour. By the way, nothing wrong with a ballpoint pen. In fact it’s possible to create fine art with it, google Nicolas V Sanchez if this link doesn’t work -> http://www.nicolasvsanchez.com/ Mind-boggling how he manages to do that with just a regular biro !!! Sounds like that piece of art was an adventure! Thanks for the tips! I’m gonna check out that brushpen, I haven’t heard of that before. ahhhhhhhhhh Nicolas Sanchez!! That’s insane!! I’ve seen a few artist who could do crazy stuff like that. I don’t think I’ll ever get to that skill level, and I don’t know if I’d want to haha. But that’s amazing. I would like to try India/Chinese ink sometime because I like the style of it. My favorite illustrator growing up was Garth Williams, so inkings always remind me of him. Oo, I’ll look forward to seeing that portrait. Haha, well I hope you have success with it!